Looking into the Grand Canyon from the Duck on a Rock formation on the South Rim of the Grand Canyon. Photo: Taylor R. Genovese. This past weekend, I zipped up my tent and crawled into my sleeping bag, teeth chattering from the plummeting temperatures of the Grand Canyon in late winter. The stars shone brightly through the mesh of my tent and the foggy belt of the Milky Way — visible to the naked eye — floated through the obsidian blackness of the sky above. My mind floated with it back to my life as a desert dweller. I grew up in a rural community southeast of Tucson, Arizona. As a child, I hated it. My friends, who lived closer to Tucson, would talk about spending their weekends at water parks, miniature golf courses, and arcades. I spent my weekends wandering the 2,000 acres of empty desert behind my parent’s house, pretending I was the first human to walk on Mars. From a child and adolescent’s viewpoint, this was sometimes perceived as a detriment to my burgeoning social life, but looking back today, these were the formative years for my research. A friend and I used to build our own rockets and cook solid rocket fuel in his mother’s oven (kids, please don’t try this at home). Some of our builds soared thousands of feet into the heavens and floated back to Earth on our homemade parachutes while some spiraled wildly into fiery explosions on the desert floor. While certainly these acts of pubescent rocket science tipped the scales of the mortally dangerous, they also served as the best hands-on research that even post-graduate students could hope to experience. It was also an education that those growing up in a post-9/11 world may not see as a viable way of learning. When neighbors heard explosions during my childhood, they knew it was the nerdy kids building rockets; today, with heightened fear and increased security, our rocket building would most likely be stopped quickly by either paranoid family or homeland security forces. I reflected on these memories while huddled in my mummy-bag. I couldn’t help but attribute my interest in the cosmos to growing up in the wide-open spaces of the Southwest United States. 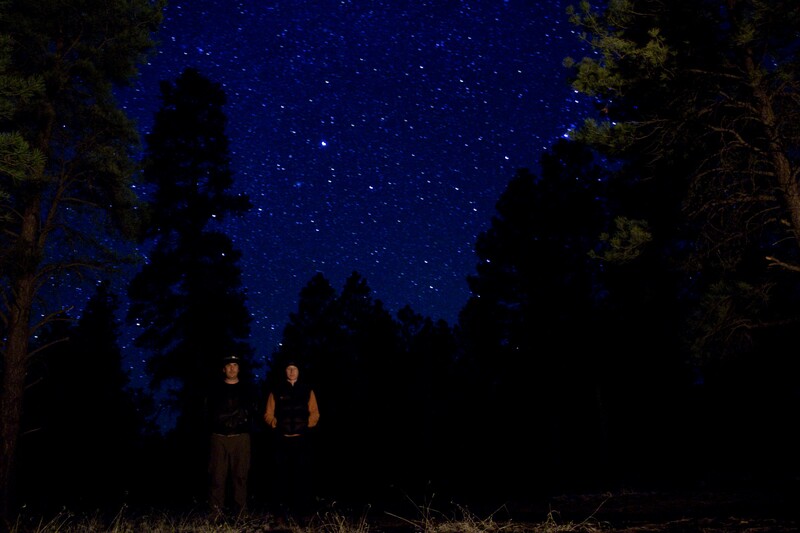 Camping in Kaibab National Forest, just south of the Grand Canyon. Photo: Taylor R. Genovese. This isn’t to say that those who dwell in our metropolises cannot have a relationship with the cosmos, but I do believe that those who are outside of the bustle of cities have a deeper — or at least a more complex — connection with our universe. With the noise and fast-paced nature that comes with living in a densely populated area, many spend much of their time with earbuds in and looking down at their feet. The quiet, clear, rural areas lend the opportunity for people to look up and wonder. Imagination and awe — that feeling of being gobsmacked — is often overlooked when weighing intelligence, but I believe it is often a prime factor in intellectual development. The Grand Canyon — with its multi-colored strata reminiscent of Hubble-imaged galaxies — was used both physically and spiritually by the indigenous people of the area. Taiowa and the Spider Woman (a god created with the purpose of creating life) fashioned a man and a woman and led them into our present world. The sipapu, or Place of Emergence, is said to be near the Grand Canyon (Penprase, 95). The Place of Emergence? Photo: Taylor R. Genovese. 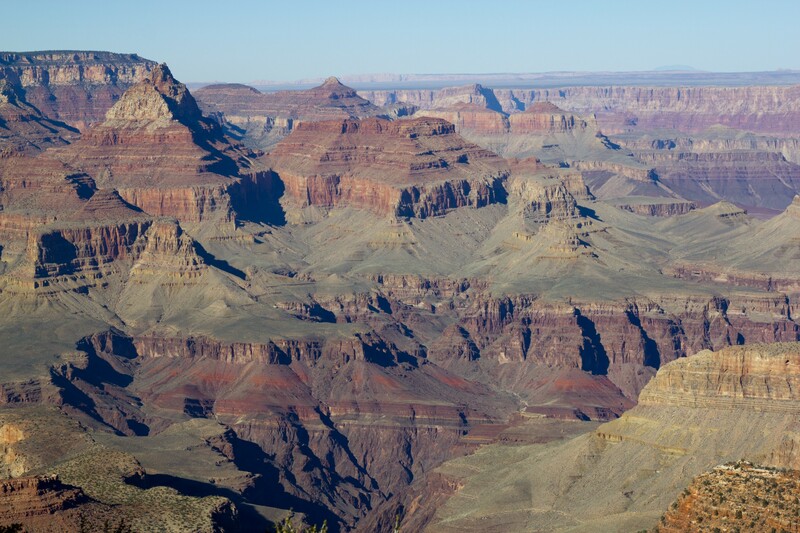 The Anasazi — who lived in the region around AD 1100 — used a site near the Grand Canyon called Cardenas Hill to measure the summer and winter solstices through a hole in the eastern rim of the Grand Canyon. The hole allowed a single beam of light to shine through during the solstices and hit the floor of a ruin that still exists today (Calvin, 176). Interestingly, the colonizers of the West chose to respect the power of the Southwest’s dark skies as well. Whether the motivation was economic or not, the fact that Tucson’s streetlights are heavily regulated in order to maintain light pollution allows for residents to see more stars than the average city-dweller. This respect and intimate connection with outer space has made Arizona a leader in the space industry. Kitt Peak National Observatory, just outside of Tucson, is the largest and most diverse gathering of astronomical instruments in the entire world. The University of Arizona’s Lunar and Planetary Laboratory (LPL) is the only public university to land and maintain a spacecraft on another planet and continues to run an orbiting imager around Mars. Next year, the LPL (among others) is slated to launch OSIRIS-REx, the first U.S. mission to fly a spacecraft to an asteroid and return samples to Earth. So, despite the politics of the state of Arizona, this place will always be special to me, just as it was to others for thousands of years. It is the place where I fell in love with the universe. While I started to drift to sleep under the embrace of starlight, I wouldn’t want to be anywhere else. Calvin, William H. 1991. How the Shaman Stole the Moon: In Search of Ancient Prophet-Scientists : From Stonehenge to the Grand Canyon. New York: Bantam Books. Penprase, Bryan E. 2011. The power of stars: How Celestial Observations Have Shaped Civilization. New York: Springer. Waters, Frank and Oswald White Bear Fredericks. 1977. Book of the Hopi. New York; Harmondsworth, England: Penguin Books. Please Cite as: Genovese, Taylor R. 2015. “Room To Dream: Space and the American Southwest.” Space+Anthropology, March 24. Taylor R. Genovese is a Ph.D. student in the School for the Future of Innovation in Society at Arizona State University. His research interests include visual ethnography, outer space, futures, social imaginaries, decolonization, anarchism, and social movements. STS PhD student @ ASU. Co-Founder Footnotes. Researching outer space anthropology, Cosmism, Proletkult, utopia, multimodality. Motto: Total Gonzo Ⓐnthropology.